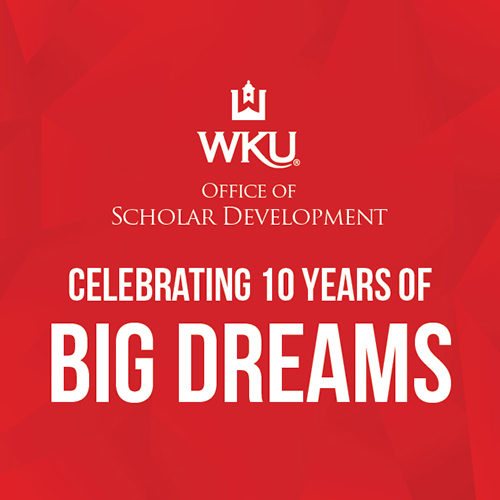 The 2018-19 academic year marks the tenth year since the Office of Scholar Development at Western Kentucky University was created. Established in 2008, OSD helps WKU students apply for and win nationally competitive scholarships. Over its ten-year history, OSD has helped WKU students and alumni earn recognition more than 450 times and more than $4.8 million in national scholarships. WKU students have won some of the nation’s most prestigious awards, including the Harry S. Truman Scholarship, National Science Foundation Graduate Research Fellowship, Fulbright U.S. Program, Thomas R. Pickering Foreign Affairs Fellowship, David M. Boren Awards and Benjamin A. Gilman International Scholarships. These scholarships enabled students to study abroad in more than 60 countries, learn languages critical to U.S. national security, earn graduate degrees at elite institutions and pursue public service, both domestically and internationally. According to Dr. Audra Jennings, director of OSD and associate professor of history, these successes are due to the support the WKU and Bowling Green communities provide to students. A great example of this commitment to undergraduate mentorship can be found in the Fulbright U.S. Student Program, said Dr. Melinda Grimsley-Smith, OSD’s coordinator of international scholarships and Fulbright Program Advisor. WKU has been recognized as a Fulbright top-producing institution for four consecutive years and five times overall. From the Fulbright Program’s creation in 1946 to 2008, only 8 WKU students were awarded Fulbright grants. However, since 2008, more than 50 WKU students and alumni earned grants. OSD will celebrate its tenth anniversary at Homecoming 2018 on October 27, 2018. OSD invites alumni, current students, and friends of OSD to join the celebration from 2-6pm on South Lawn. A more detailed history of OSD and instructions on how to RSVP for OSD’s Homecoming Celebration can be found at: wku.edu/osd/anniversary. Contact: Cory Dodds, (270) 745-5043.